A couple of weeks ago I played at the PF Devon and Cornwall conference, a gig I love to play each year, and a great reason to step foot upon my home county of Cornwall. On the Sunday after the conference the Boscastle Museum of Witchcraft opens for that one Sunday, so many of the people at the conference descend upon the town to see what’s been happening at the museum. Now I cannot go to Boscastle without walking to the top of the cliffs to look out upon the mightly Atlantic ocean, and it was here, about 14 years ago that I heard the refrain that opens my song The Winter King in the sound of the sea as it struck the cliffs below. So this time I took some footage on my walk up to put into a video to go with the song. It’s VERY shaky, but it does show the beauty of the place, and the inspiration behind the refrain, and the rest of King Arthur’s song. I hope you enjoy it, despite the wobbly videoing! The Quest for the Awen, yearning for those three sweet drops to fall upon my tongue, to open my eyes and see the world through the eyes of a poet is still a Quest that drives me every day. Nature is the world’s most intoxicating drug and the great thing is that in all of my encounters with her, the side effects of this particular addiction have all been, without exception, completely positive. I am blessed by the fact that my chosen medium, acoustic folk, is infinitely portable – from an acoustic guitar or for even more portability, the tiny mandolin. I have written many songs in the quiet of my own home, but a number of the songwriting experiences I remember with most fondness are the songs that I caught whilst playing outside. Some people find inspiration in conflict. Friction can be a wonderful source of inspiration and it has been for me a couple of times, Only Human instantly springs to mind, a song that I had to write after watching a program about animal experimentation, but for me the main source of inspiration is peace. I guess some may find no inspiration in peace at all, finding it too dull, still or quiet, but I have always known that I have within me an inner hermit who yearns for that sacred solitude that opens us up to the Divine. Oak Broom and Meadowsweet was written in a woodland near Beltane, the floor covered with bluebells, and the voices of the Faerie almost dictating the words; Noon of the Solstice was written in the same woods, near the time of the Solstice, singing the words to the Horned God standing with my back to a mighty Oak; Hills they are Hollow was written in the stone circle at Merrivale with the ‘Tors standing as Guardians to the rites to Nature’s Gods of darkness and of light’; and Grimspound was written in the large roundhouse at the site listening to the calling Ravens and the voices within the fallen walls. Other sites have inspired songs that have arrived some time after getting home. Land, Sky and Sea was inspired by a visit to St Ninian’s cave in Dumfries and Galloway where every day St Ninian used to make a pilgrimage down to the sea, to sit in this tranquil cave, and here he said he could talk to God and hear his reply. When I went to the place I also sat and spoke aloud, possibly to different Gods, but still there was a sense of connection that I can vividly remember whilst writing this. It is taking these experiences and putting them into words that have been a large part of my songwriting over the years. So what to do? Well, I get on my walking boots, go outside, take my instrument with me, and a pen and paper. 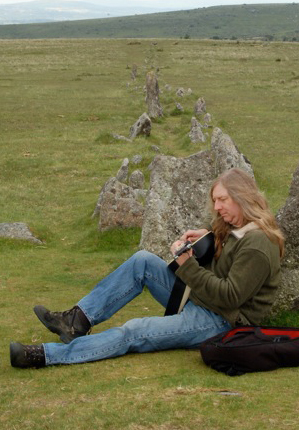 Choose a site that I love, and make a sacred pilgrimage to the place, making my intent the connection to the Site, not writing a song – the song comes from the connection. voice cannot get through. Combine this with conscious breathing and the connection with the place, and its energies, open to me, and then, sometimes, something wonderful happens, and I begin to hear the words of the Ancestors, then voices of the Faerie, the stories of the Stones. Usually I just ‘noodle’ on the guitar, playing the words I hear with notes. We know that sound is vibration, that music is tuned vibration, and notes do not end after the string is played, but rather carry on out into the universe, and endless space. That is the space I get into, and if I am lucky I will catch a word or two, and begin to sing over the tune, and sometimes these words become a song. It is the sense of peace I feel at these places that lets me open up to the flow of Awen. It is when I allow my inner hermit his space that the songs I feel most connection with are given voice. Do you have an inner hermit/monk? Do they get enough space? If not, try to give them time and space, and there you too might find peace, and taste the Awen. What are they, these enigmatic circles of stone that can be found all across this land of Albion? I remember the first time I consciously visited one. 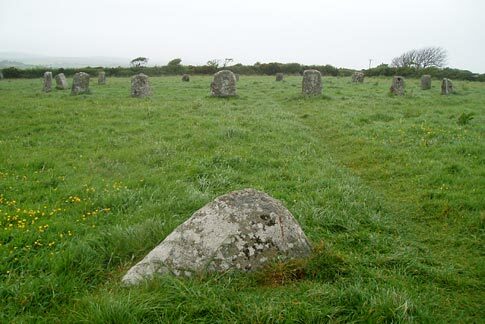 It was the Merry Maidens stone circle in Cornwall. My eldest son Zakk was still a baby, the sun was shining on a beautiful Summer’s day and we were on our family holiday, once more visiting my county of birth. Our next point of call was the Boscastle Museum of Witchcraft, but first we headed further down the county to seek out this mysterious place. Parking the car on a grassy verge we got together all of the kit needed when you take babies with you on holiday – we were planning on having a picnic here too. I remember that day so clearly. I walked around the stone circle first, walking sunwise, spending a little time with each stone, reaching out and touching it, opening to its energy. Upon stepping inside I felt the air change – this happens when certain people cast their magical circles around sacred space too. It’s like the air becomes thicker, warmer, inside. I sat with my back to the eastern stone and watched my son crawling through the lush, long grass. Occasionally getting up and pointing him to crawl back to me when he got too far away. There was magic here, a magic I felt in many other places during following years. For some time I was a sales rep, on the road, calling on customers from Cornwall, Wales, Cumbria and Scotland. My area was the west of Britain, and I had to spend quite some time out on business trips. What I would do was look at my route for the week, then plan the sacred sites I could visit after my last call on each day. I had the Ordnance Survey Map of Ancient Britain and literally ticked off the places I’d been to as I travelled around. During this time I managed to visit a lot of sites. From the recumbent stone circles of Scotland, to Castlerigg, Arbor Low, the Druid Circle near Penmaenmawr, the Rollrights, Avebury and Stonehenge, Stanton Drew, Merrivale, and many other sites that are marked on the OS maps but have no name, some of which were so run down, or in the middle of the moors, that I had to really search for them. Occasionally I would find offerings left by others – a small bunch of flowers, or a little cake. Sometimes there would be a candle, and sometimes wax on the stones themselves, and I found this harder to reconcile. But the degradable offerings I loved to find, as they showed that I was not alone in my love for these places, and that they were still centres of worship thousands of years after they were originally built. But this does open the argument for or against leaving offerings at sites. I have heard some people call these offerings ‘debris’. I have seen one woman who worked for a sacred site tip out a plastic bag of offerings onto a table at a Pagan conference and go through them one by one. I have to say she did this in a very derogatory way, even when she unrolled a small scroll of paper that had been left at a stone circle and read out the handwritten poem to a departed loved one, as if it said nothing more than ‘Darren Waz Ere’. I found this as disrespectful to the person who had left this offering, as she did about the ‘debris’ itself. Obviously this wasn’t and still isn’t a simple issue. However when Cerri suggested that it might be a good idea to have a table at their site so people can leave offerings there that idea was scoffed at and dismissed as this ‘suggests we know that these stone circles were religious centres and they might just have been goat pens!’ Okay then, continue to deal with the ‘debris’. 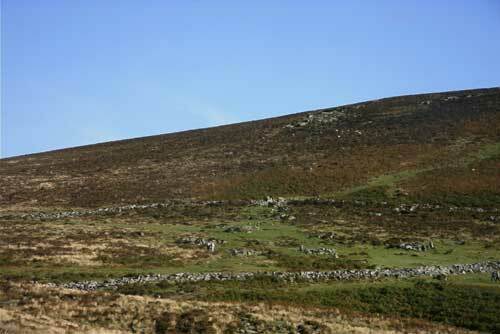 To me these circles of stone are a legacy left by our ancestors. The people who built them were Pagan (although we don’t know the details of their beliefs). The Paganism of today has emerged as a need of our time, and these sites form a direct link to those that came before, and I think it is right that we respectfully hold our ceremonies at these sites, that we visit them and seek wisdom there, and also that we build our own like the one on Limetree Farm in Yorkshire. The other choice is to leave them as sterile monuments for tourists to photograph, then get back on the coach until the next one, possibly giving them no further thought. I think (and of course I may be wrong) that if the people who built these sites 5000+ years ago knew that in the year 2010 there were still Pagans who revered the Earth, who worked with pantheons of Pagan Deities, were meeting and working their magic at that same site, trying to get in touch with the feelings and energies that the builders might also have been seeking, I think they would be very happy about that. And even if they are just goat pens (and I really don’t believe that!) a part of modern Paganism is a reverence for our ancient ancestors, and these sites form that link with them. Their blood and sweat helped form them, and our rituals today are empowered by them, their legacy, and their memory. It’s been some time since I posted a proper blog entry. I’ve been so busy playing music, recording, and writing that The Bardic Blog lay sad and neglected for which I apologise. Another reason is that I’ve been posting updates and photos to my Twitter account as things have happened, so it feels like I’ve already written about everything already. But I know a lot of you readers are not Twitter people, so I’m going to try to keep up with things a bit better from now on. I’ll start this bit of catch up with the house concert I played at the Plymouth moot on the 25th April. I played a number of house concerts last year and thoroughly enjoyed the intimacy of this type of performance, but sadly I’ve not had a chance to play hardly any this year (something that I will be rectifying for 2010 so if you’re interested, do email me on damh@paganmusic.co.uk and I’ll send you details), however I was invited to visit the Plymouth moot that is held in one of its member’s houses. In advance of the concert the people of the moot held a raffle, and a fund-raising evening and by doing this they were able to only charge £1 for the entry fee. The more I visit Pagans in the Great South West the more impressed I am with the way they work together to get things done, they really are an amazing bunch of people! So Cerri and I set off for Plymouth at about 10.30am as we had also been asked to lead the group’s Beltane ritual later that afternoon. Now Cerri had just got a second-hand Land Rover Freelander, which we had taken to Glastonbury the weekend before and it was such a pleasant ride we decided to take it again, this time to Plymouth. It had just had the head gasket replaced… Yes, you probably know what’s coming next… Just past Chichester the car overheated, and broke down. This has to be one of the travelling musician’s biggest nightmares! On your way to a gig you break down. In Plymouth people would soon be gathering to hear you play (and hold the ritual) and you just couldn’t get there!! What to do? Luckily I have the best parents in the entire world, no kidding! I got on the phone to my Dad who drove down to us, he stayed with the broken down Land Rover and waited for the AA, while me and Cerri continued our journey in his car. I’m not joking when I say that it felt like Thunderbird 2 had arrived after calling International Rescue! What a dude he is! So a couple of hours later we began our journey again, and amazingly arrived at the house at 3.30! The ritual was great, and then in the evening people began to arrive for the concert. And then more people arrived, and more people arrived… In the end there were over 50 people in the lounge (I couldn’t fit them all into the photo)! But it didn’t feel crushed, most were in comfy armchairs, happily supping mead – very civilised. And as for the response, well, I was really taken back by the welcome we received. There was one point when I forgot my words ( it does happen occasionally) and the audience just carried on singing without me. Wonderful stuff! I really do hope that I get invited back again next year. More Tales from the Road soon! Proving that nobody should ever DARE me to play a song live. 200 Pagans all singing along and doing the actions – what a laugh that was! I had no idea it was being filmed, but am very glad it was! ROFL! From the Pagan Federation Devon and Cornwall conference this March.